Gathered round the fire at the Maypole Inn, in the village of Chigwell, on an evening of foul weather in the year 1775, are John Willet, proprietor of the Maypole, and his three cronies. One of the three, Solomon Daisy, tells an ill-kempt stranger at the inn a well-known local tale of the murder of Reuben Haredale which had occurred 22 years ago that very day. Reuben had been the owner of the Warren, a local estate which is now the residence of Geoffrey, the deceased Reuben's brother, and Geoffrey's niece, Reuben's daughter Emma Haredale. After the murder, Reuben's gardener and steward went missing and were suspects in the crime. A body was later found and identified as that of the steward, so the gardener was assumed to be the murderer. Joe Willet, son of the Maypole proprietor, quarrels with his father because John treats 20-year-old Joe as a child. Finally having had enough of this ill treatment, Joe leaves the Maypole and goes for a soldier, stopping to say goodbye to the woman he loves, Dolly Varden, daughter of London locksmith Gabriel Varden. Meanwhile, Edward Chester is in love with Emma Haredale. Both Edward's father, John Chester, and Emma's uncle, the Catholic Geoffrey Haredale – these two are sworn enemies – oppose the union after Sir John untruthfully convinces Geoffrey that Edward's intentions are dishonourable. Sir John intends to marry Edward to a woman with a rich inheritance, to support John's expensive lifestyle and to pay off his debtors. 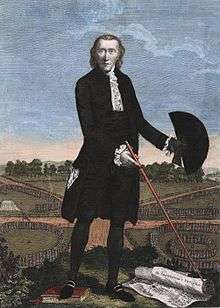 Edward quarrels with his father and leaves home for the West Indies. Barnaby Rudge, a simpleton, wanders in and out of the story with his pet raven, Grip. Barnaby's mother begins to receive visits from the ill-kempt stranger, whom she feels compelled to protect. She later gives up the annuity she had been receiving from Geoffrey Haredale and, without explanation, takes Barnaby and leaves the city hoping to escape the unwanted visitor. The story advances five years to a wintry evening in early 1780. On the 27th anniversary of Reuben Haredale's murder, Soloman Daisy, winding the bell tower clock, sees a ghost in the churchyard. He reports this hair-raising event to his friends at the Maypole, and John Willet decides that Geoffrey Haredale should hear the story. He departs in a winter storm taking Hugh, hostler of the Maypole, as a guide. On the way back to the Maypole, John and Hugh are met by three men seeking the way to London. Finding that London is still 13 miles off, the men seek refuge for the night. Beds are prepared for them at the Maypole. These visitors prove to be Lord George Gordon; his secretary, Gashford; and a servant, John Grueby. Lord George makes an impassioned speech full of anti-papist sentiment, arguing (among other things) that Catholics in the military would, given a chance, join forces with their co-religionists on the Continent and attack Britain. Next day the three depart for London, inciting anti-Catholic sentiment along the way and recruiting Protestant volunteers, from whom Ned Dennis, hangman of Tyburn, and Simon Tappertit, former apprentice to Gabriel Varden, are chosen as leaders. Hugh, finding a handbill left at the Maypole, joins the Protestant throng which Dickens describes as "sprinkled doubtless here and there with honest zealots, but composed for the most part of the very scum and refuse of London, whose growth was fostered by bad criminal laws, bad prison regulations, and the worst conceivable police." Barnaby and his mother have been living quietly in a country village, their whereabouts unknown despite Geoffrey Haredale's attempts to find them. The mysterious stranger finds them and sends Stagg, the blind man, to attempt to get money from them. Barnaby and his mother then flee to London, hoping to again lose their pursuer. When Barnaby and his mother arrive at Westminster Bridge they see an unruly crowd heading for a meeting on the Surrey side of the river. Barnaby is duped into joining them, despite his mother's pleas. The rioters then march on Parliament, and burn several Catholic churches and the homes of Catholic families. A detachment led by Hugh and Dennis head for Chigwell, intent on exacting revenge on Geoffrey Haredale, leaving Barnaby to guard The Boot, the tavern they use as their headquarters. The mob loots the Maypole on their way to the Warren, which they burn to the ground. Emma Haredale and Dolly Varden (now Emma's companion) are taken captive by the rioters. Barnaby is taken prisoner by soldiers and held in Newgate, which the mob plans to storm. The mysterious stranger haunting Mrs. Rudge is captured by Haredale at the smoldering ruins of the Warren. He turns out to be Barnaby Rudge Sr., the steward who had murdered Reuben Haredale and his gardener years earlier. It is revealed that he had switched clothes with the dead gardener to divert suspicion from himself. The rioters capture Gabriel Varden, with the help of his wife's maid Miggs, and attempt to have the locksmith help them break into Newgate to release prisoners. He refuses and is rescued by two men, one of whom has only one arm. The rioters then burn Newgate where Barnaby and his father are being held. All of the prisoners escape, but Barnaby, his father, and Hugh are betrayed by Dennis the hangman and captured by soldiers. Dennis has changed sides, believing he will obtain the bounty offered for them as well as numerous clients needing his special talents. With the military patrolling the streets, the rioters scatter and many are killed. The one-armed man turns out to be Joe Willet, who has returned from fighting against the American revolutionaries. Joe and Edward Chester turn out to be the rescuers of Gabriel Varden. The pair then rescue Dolly and Emma. Dennis is arrested and sentenced to die with Hugh and Barnaby. Hugh and Dennis are hanged. Barnaby, through the efforts of Gabriel Varden, is pardoned. Joe and Dolly are married and become proprietors of the rebuilt Maypole. Edward Chester and Emma are married and go to the West Indies. Miggs tries to get her position back at the Varden household, is rejected, and becomes a jailer at a women's prison. Simon Tappertit, his legs crushed in the riots, becomes a shoe-black. Gashford later commits suicide. Lord George Gordon is held in the Tower and is later judged to be innocent of inciting the riots. Sir John Chester, now a member of parliament, turns out to be the father of Hugh and is killed in a duel by Geoffrey Haredale. Haredale escapes to the continent where he ends his days in a monastery. Barnaby and his mother live out their years tending a farm at the Maypole Inn where Barnaby can work effectively due to his physical strength. Grip the raven inspired Edgar Allan Poe to write his most famous poem, "The Raven." Poe had written a review of Barnaby Rudge for Graham's Magazine saying, among other things, that the raven should have served a more symbolic prophetic purpose. Thomas Higgie adapted it into a three-act play in 1854. Charles Selby and Charles Melville did the same in 1875. The latter was produced at the English Opera House. In 1915 Thomas Bentley directed Barnaby Rudge, "the biggest-budget British film of its day", but it is now lost. The BBC made a 13 episode TV series in 1960. 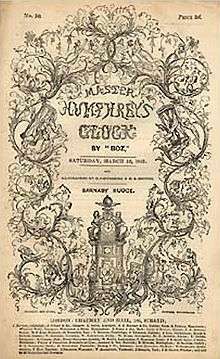 Barnaby Rudge was re-invented as a stage play, The Locksmith of London, by Eileen Norris. It was staged in 2012 at the Kings Theatre, Southsea by Alchemy Theatre, where the Dickens Fellowship attended a performance during their annual conference. BBC Radio 4 chose it for their Classic Serial in 2014, and cast an actor with Down's Syndrome, Daniel Laurie, in the title role. ↑ Peter Ackroyd has called it "one of Dickens's most neglected, but most rewarding, novels"
↑ Marzials, Frank Thomas (1908). Life of Charles Dickens. p. 262. Retrieved 13 May 2016. ↑ "itle-page of "Barnaby Rudge. A Domestic Drama, In Three Acts"". The Victorian Web. Retrieved 13 May 2016. ↑ "Barnaby Rudge Website". Dickens Fellowship. Retrieved 13 May 2016. ↑ Rose, Damon (24 May 2014). "The actor with Down's syndrome tackling Dickens". BBC. Retrieved 5 August 2016. He plays Barnaby Rudge in a new radio adaptation of one of Charles Dickens's lesser-known works. Rudge is an "idiot" as the language of the time would have it. Today we might say he has a learning disability.